Yoga-Ventures: Private Yoga Therapy in person or online. 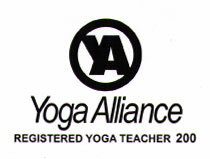 "You remain my best yoga teacher!" You won't find me teaching lots of yoga classes every week in a packed yoga center; I teach small classes and one-on-one so that the student gets as much attention as possible. I also practice what I preach: a balanced life. There is more to life than work! "Relax, breathe, play!" Is my mantra. I teach Hatha yoga, an open style of yoga that incorporates meditation, breathing, and postures to achieve a more balanced life. I believe that a yoga practice should be tailored to the person and not the other way around. My students have described my teaching style as light-hearted, gentle, easy to follow, accessible, and therapeutic - good news, because that is my intention! It is a myth that you have to be flexible to do yoga. A yoga practice may help you become more flexible, but that's not the goal. The only requirement to practice yoga is a desire to know yourself better, and the only goal is to feel better. In Andria's first yoga class in 1991, she breathed as if for the first time. Astounded by this feeling, she wanted to share it with others. Andria decided to have an early mid-life crisis while in college in the 90's. Diploma in hand, she immediately shunned the cubicle and began a life of adventure as a professional whitewater raft guide. These two lives eventually merged, and Andria used the off-season in 2001-2002 to become trained as a yoga teacher from the esteemed Asheville Yoga Center. Planning to return to the raft outpost forever, her life took a turn when she met her future husband, Leland, around the same time that she incurred a second shoulder injury. Andria used the yoga in her yoga teacher training program to heal her shoulder completely, and this was the inspiration for the later Yoga for Shoulders DVD. With her shoulder healed and ready for adventure, Andria and Leland bought an old van and began traveling the continent in search of whitewater and ways to pay for their adventures, which often became an adventure in itself! Their lifestyle eventually became unsustainable as the world became a much more expensive place and jobs got harder to find. They soon found themselves in a dizzying amount of debt and jobless. Luckily, desperation breeds creativity! That very winter they created their first yoga DVD, Yoga for Paddlers and published Leland's first guidebook, North Carolina Rivers & Creeks - a company was born! If you'd like to listen to a special Valentine's Day version of their story read by Andria, click here. After the success of Yoga for Paddlers, Andria and Leland began designing yoga DVDs for other sports, such as cycling and climbing. Andria's approachable teaching style created a following, and despite everyone's declaration that outdoor people would never be into yoga, they have sold thousands of DVDs and have heard many success stories about how her DVDs, workshops, and classes have changed athletes' lives for the better. Inspired by her own healing from multiple shoulder injuries and a debilitating back injury as well as the healing of many of her students, Andria decided to take her teaching one step further and become a yoga therapist. 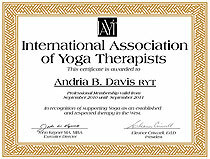 She began taking courses and became a member of the International Association of Yoga Therapists in 2010. In between teaching and studying yoga and creating yoga DVDs, Andria continues to play on rivers and other outdoor landscapes, plus guide and teach whitewater rafting and kayaking. She also co-authored the whitewater guidebook, The River Gypsies' Guide to North America and has provided yoga content for national publications such as Women's Adventure Magazine. All material and photos ©2010 Brushy Mountain Publishing, Inc.
Yoga Ventures is a division of Brushy Mountain Publishing. Sessions with Andria now available in person or online via skype!